Basler & Hofmann has become a member of the IMFSE Sponsorship Consortium! A big thank you and welcome! OFR Consultants has become a member of the IMFSE Sponsorship Consortium! A big thank you and welcome! Read their press release here. The IMFSE team is very proud to have been awarded the SFPE 2018 ‘David A. Lucht Lamp of Knowledge Award’: https://www.sfpe.org/page/LuchtRecipients This award honors an organization, company, or individual that has contributed substantially to increasing the opportunities for higher education in fire protection engineering. Alumnus Davood Zeinali had two articles published in the journal of Combustion and Flame: Experimental study of corner fires Part I and Part II. Alumnus Simon Santamaria wins the John Moyes Lessells Travel Scholarship, which is designed for "Honours Graduates in Engineering from Scottish Universities, who wish to study some aspect of their profession outwith the UK". The 2018 Bigglestone was awarded to a paper on probabilistic fire safety engineering (doi 10.1007/s10694-017-0660-4) authored by IMFSE lecturer Ruben Van Coile, together with Georgios Balomenos, Mahesh Pandey and Robby Caspeele. The Harry C. Bigglestone award is given annually to the paper appearing in Fire Technology that best represents excellence in the communication of fire protection concepts. This is the second year in a row that a paper led by an IMFSE lecturer is awarded, with last year's award going to a paper on evacuation modelling led by Enrico Ronchi. The European Commission made a video about IMFSE! Available here and here. Dr. Barbara Lane (Arup) has been elected Fellow of the Royal Society of Edinburgh (https://www.rse.org.uk/fellow/barbara-lane/). Sincere congratulations! NFPA and GAE Engineering joined the Sponsorship Consortium. Welcome! The Fire Research group at our Associated Partner The University of Queensland now issues a newsletter. The very first issue features IMFSE in an article about the thesis research of Pascale Vacca and Nemer Abusamha. IMFSE is labeled as a 'success story' and a 'good practice example' on the Erasmus+ Project Results platform. IMFSE alumnus Carmen Gorska Putynska won the Best Poster Award at the occasion of the 12th IAFSS Symposium (June 2017 - Lund) with her research on 'Self-extinguishment of Exposed Cross Laminated Timber Walls in Compartment Fires'. Congratulations, Carmen! June: IMFSE alumnus Carmen Gorska Putynska won the Best Poster Award at the occasion of the 12th IAFSS Symposium (June 2017 - Lund). The poster presented her research on 'Self-extinguishment of Exposed Cross Laminated Timber Walls in Compartment Fires' wich is being performed at the University of Queensland (Australia) under the supervision of Juan P. Hidalgo and Jose Torero. March: Lecture by Dr. Michael Spearpoint: ‘Why don't we just put sprinklers everywhere and forget about fire engineering design?’ Monday 27 March 2017, 10h – 11h30, Ghent. Practical info can be found here. Welcome! February: the 3rd edition of the Fire Safety Engineering-day (16 February - Lund) was a true success. See this blog post and the photo reportage. January: Kingspan commits to sponsoring the IMFSE programme strengtening the Sponsorship Consortium even more. Alumnus Daan Van den Broecke wins the Daan Sugden Award from ATS, with his paper on FSE in tunnels. October: IMFSE Student Chapter recognized by SFPE! The Student Chapters are listed here. September: IMFSE alumnus Daniel Martin (USA) wins the very first 'IWMA Young Talent Award 2016' with his thesis 'The Use of a Water Mist Curtain as a Radiation Shield'. Congratulations! September: Nils Johansson, Stefan Svensson and Patrick van Hees (Lund University) have been awarded with the prestigious Jack Bono Award for Engineering Communications. April: Prof. Bart Merci from Ghent University visits the division of Fire Safety Engineering at Lund University and gave lectures on CFD and fires in car parks for students and staff. April: Prof. Bart Merci and dr. Tarek Beji wrote a book on fire and smoke dynamics, giving fluid mechanics aspects a central role in the story. The book has now been published, please find more information here. March: Prof. José L. Torero, who helped launch the IMFSE programme for the University of Edinburgh (UK) and who currently works for the University of Queensland (Australia), has been awarded the Honorary Doctorate at Ghent University (Belgium). December: Missed the Virtual Tour in or want to double check something? Find the Virtual Tour Presentations here! September: IMFSE alumnus Arne Inghelbrecht gave a talk on the New Zealand Fire Service Perspective at the UQ SFPE Seminar. September: the IMFSE Management Board welcomes Prof. Luke Bisby as new representative of the University of Edinburgh, in replacement of Prof. Albert Simeoni. September: find the pictures of the Graduation Ceremony 2015 here! August: The University of Maryland (US) joins IMFSE as Associated Partner. Welcome! July: the new sponsors for IMFSE are announced in the IAFSS newsletter (pg. 6)! February: Read this enthralling new paper on how IMFSE is 'Setting the reference of Fire Safety Degrees' here! February: IMFSE is very pleased to announce they have a new sponsor! 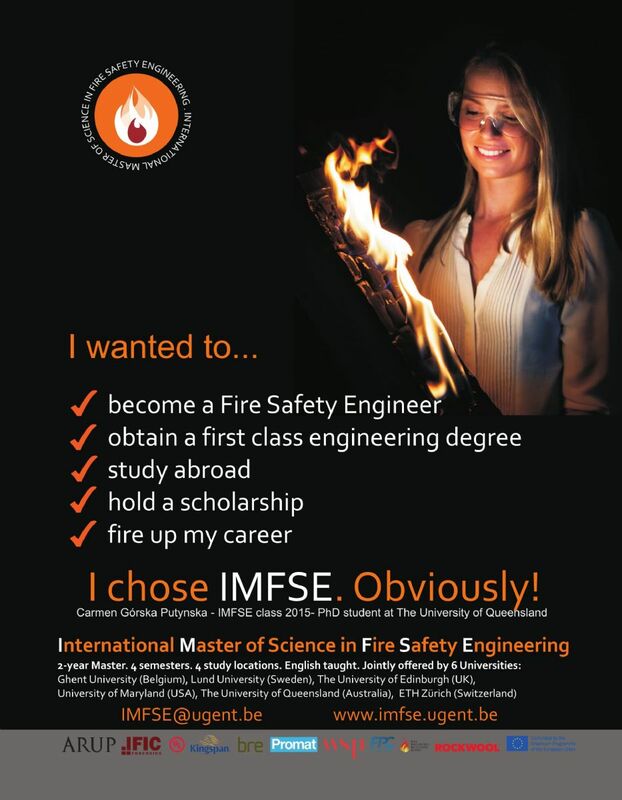 Fire Engineered Solutions Ghent (Belgium), an engineering company specialised in fire safety engineering, will sponsor 1 IMFSE student on the basis of € 6000 per year, for the next 3 years, starting from September 2015! December: The IAFSS newsletter is out now! Read all about IMFSE on pages 7, 9 and 10! September: The 1st IMFSE Fire Safety Engineering Day on 18 September at the Fire Service Station in Antwerp, Belgium was a big success! Here you can read the summary of the very interesting panel discussion held that day. June: Graduation Ceremony of the IMFSE-2012 students. Congraduations! June: Edinburgh blog: "Fire Group Members Work to Better Understand Wildland Fires"
June: Trends - The FPC newsletter with a reference to the thesis of IMFSE student Eron Desloover on the last page! May: Student visit to the Fire research centre SP in Boras (Sweden). March: Prof. Patrick van Hees, the IMFSE program director at Lund University, has been elected as Chairman of the International Association for Fire Safety Science (IAFSS). February: Prof. Torero (University of Queensland) and Prof. Merci (Ghent University) presented an invited lecture at the 11th IAFSS Symposium. G. Maragkos, P. Rauwoens and B. Merci, "Differential Diffusion Effects in Numerical Simulations of Laminar, Axi-symmetric H-2/ N-2-air Diffusion flames", International Journal of Hydrogyn Energy, Vol. 39, pp. 13285- 13291 (2014). Click here for the full article. S. Verstockt, S. Van Hoecke, P. De Potter, P. Lambert, C. Hollemeersch, B. Sette, B. Merci and R. Van de Walle, "Multi-modal Time-of-flight Based Fire Detection", Multimedia Tools and Applications, Vol. 69, pp. 313-338 (2014). Click here for the full article. T. Beji, B. Merci, S. Verstockt and R. Van de Walle, "On the Use of Real-time Video to Forecast Fire Growth in Enclosures", Fire Technology, Vol. 50, pp. 1021-1040 (2014). Click here for the full article. September - the IMFSE Management Board welcomes Prof. Albert Simeoni as new representative of the University of Edinburgh, in replacement of Prof. José Torero. March -The IAFSS newsletter includes updates and pictures from IMFSE and its partner universities. More info. Fire Safety Journal, Vol. 59, pp. 160 - 165 (2013). See here. X. Deckers, S. Haga, N. Tilley and B. Merci, “Smoke control in case of fire in a large car park: CFD Simulations of Full-Scale Configurations”, Fire Safety Journal, Vol. 57, pp. 22-34 (2013). See here. August - IMFSE illustrates the cover of the latest IAFSS newsletter. See here. N. Tilley, X. Deckers and B. Merci, “CFD Study of Relation between Ventilation Velocity and Smoke Backlayering Distance in Large Closed Car Parks”, Fire Safety Journal, Vol. 48, pp. 11-20 (2012). See here. The Society of Fire Protection Engineers publishes a quarterly newsletter. Read the latest SFPE newsletter here. More information on the SFPE can be found on their website.